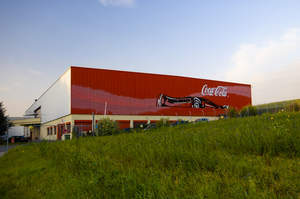 BUSSIGNY, SWITZERLAND--(Marketwire - September 23, 2010) - Westcore Europe, an affiliate of U.S.-based Westcore Properties, today announced the 12'120'000 (CHF) sale of Coca Cola Logistics, a 7,174-square-meter industrial building located at Route de Sorge 1 in Bussigny-Pres-Lausanne, Switzerland, to Procimmo Swiss Commercial Fund (PSCF), a public real estate investment fund. Westcore Europe represented itself in the transaction. The buyer was represented by Jean-Philippe Barbey of NAEF & Cie. The lender was Banque Cantonale Vaudoise (BCV). According to Olivier Hezelot, asset manager with Westcore Europe, the sale follows Westcore's successful completion of several value-added capital improvements. "This first rate property is well-located in a commercial development zone, just 40 minutes from the Geneva Airport and less than a mile from the E25 Highway, leading to the A1 Highway connecting Geneva with Lausanne and Bern. This coupled with its fully leased status to strong credit tenants, represented a great opportunity for PSCF," he said. The primarily industrial facility also includes mixed-use and office space. Tenants of the building include DHL Express and Societe de la Loterie de la Suisse Romande. PSCF plans to hold the property as an investment. Westcore Europe acquired the Coca Cola Logistics building in 2006. The project is part of Westcore's worldwide 10.6-million-square-foot commercial real estate portfolio of industrial and office space. The U.S.-based (San Diego, Calif.) real estate investment company is continuing to acquire well located logistics and office buildings throughout Western Europe and the U.K.
For additional information, please contact Marc Brutten in the U.S. (mbrutten@westcore.net) or Olivier Hezelot (ohezelot@westcore.net) in Geneva, Switzerland. Westcore Properties (www.westcore.net) is a private, entrepreneurial commercial real estate investment firm with a specialized focus in the western United States and key European markets. Since its founding in 2000, the company and its affiliates have acquired and managed more than $3.9 billion in industrial and office assets comprised of 550 buildings totaling over 25 million square feet. In addition to its U.S. headquarters in San Diego, Calif., Westcore Properties has regional offices in San Francisco, Calif. and Denver, Colo. The firm's European offices are located in Geneva, Switzerland and London, England.